The long wait is over and a new angel has finally arrived! Having a new member in the family is a blessing that everyone hopes for. And now that it has indeed become a reality, it is time for the angel to be christened! There are a lot of things to prepare for, but one of the essential parts is creating the christening invitation. 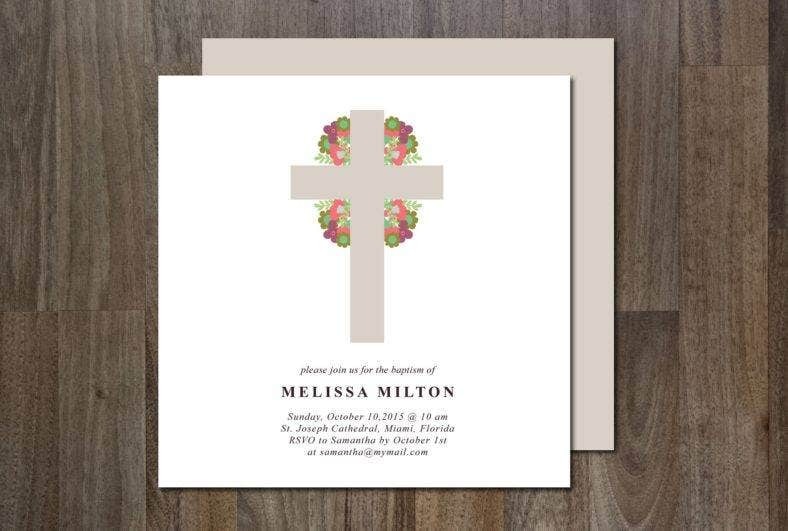 In this article, we will show you more than a handful of beautiful christening invitation designs that you can use for your child’s christening. These are all curated and picked from the best of the best! 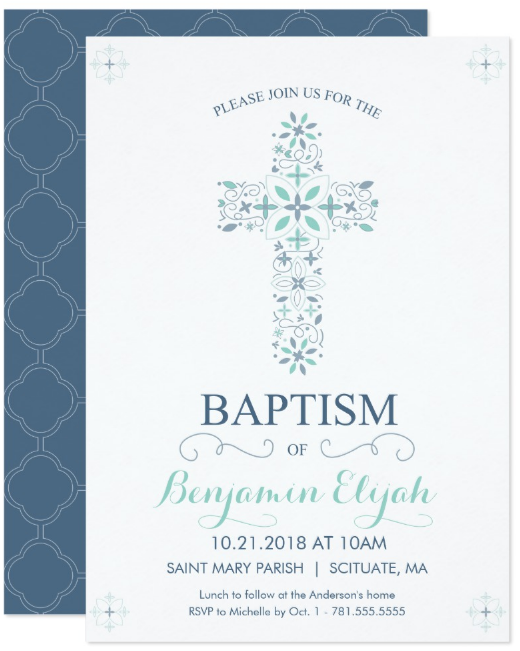 Also, we included some tips and tricks on how to create a stunning invitation with these templates, steps on how to edit and customize them, and the differentiation of christening and baptism. These words are commonly interchanged and thus are making some people confused as to which term to officially use. Both of these terms have existed long enough for people to use it interchangeably and often get their meanings lost or even combined. You may also see photo invitation templates. Baptism is the ritual use of water for purification. It is one of the seven sacraments in Christianity that admits a person into the Christian community. Also, baptism refers to adults rather than the children. The baptism practices vary from one church to another, such as cases wherein the recipients are fully submerged in water and others where water is poured or sprinkled over the head. The earliest non-biblical forms of baptism existed around 100 AD. Christening, however, existed later in the 14th century. It is defined as the ceremony of baptizing and naming a child (to “christen” means to “give a name to”). You may also see formal invitations. Baptism can be done at any age where christening is traditionally for babies and children. Christening also involves a naming ceremony while baptism usually doesn’t. With these in mind, we can say that christenings are baptisms while baptisms are not entirely christenings. But, these subtle differences have thinned down in recent times. Churches now name the child during a baptism, which it usually didn’t happen in the past. Times have changed and people are moving on to new methods. It will depend on you on how you want to go with the usage of terms or you can seek advice from your church on how to go with it. Christening is an event where your child will be given a name and be welcomed into the Christian world. This is a historical moment for you and your family as you embrace a new angel into your lives. If you want to share this special moment with your close friends and family, then you definitely need to send them a christening invitation. Why send them a christening invitation? You will know as you read on. You may also see elegant invitation templates. An invitation doubles for an announcement card. You can use the invitation to formally inform everyone about your new baby, especially if you kept it in secret. This will blindside the recipients as they will be sent with not one, but two exciting news: the welcoming of an angel in the family and the special occasion of formally welcoming him/her to the new world. When we say invitations set the stage, we mean that they lay all the necessary details for the actual christening. In the invitation, include the details about the event, like the location of the church and the venue after the christening; the date that the christening will be held and the time the guests should arrive at; and a dress code, if there is any. You would want to prepare your guests for everything that they need to know so that they don’t come clueless and empty-handed. You may also see invitation designs in PSD. Who doesn’t want to receive an invitation template? Putting yourself in your guests’ shoes, you will feel honored and overwhelmed as an invitation is an indication that you are important to the people who invited you. 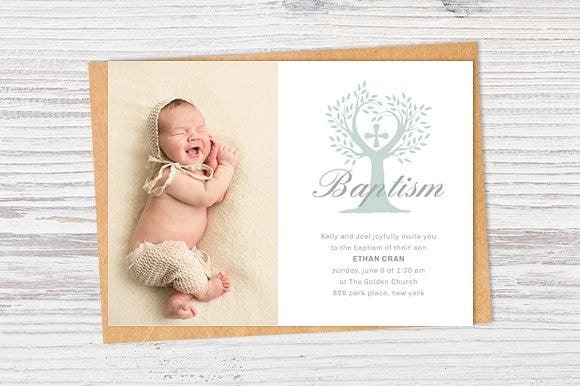 Also, sending out a customized physical christening invitation feels more personal compared to invitations sent through social media or any online platform. The convenience and efficiency that technology has given us took away the personal connection that we need. When you send out an invitation, the recipients will appreciate your effort to make and send them one. As a parent, you want to the event to be special. Everything should be perfect and visually pleasing as much as possible. With regards to the invitation, you can go all out in designing it. You can either purchase any template that we have shown you and customize it or use these templates to serve as an inspiration to create one of your own design. 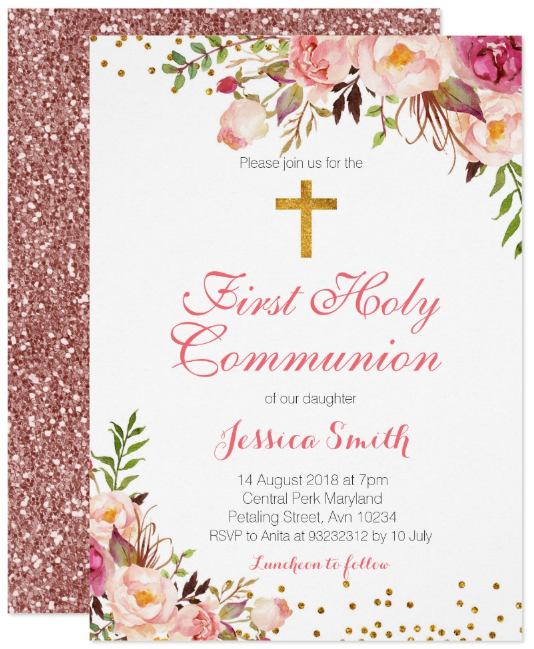 The invitation is your introduction to your child’s christening, so make a good impression! 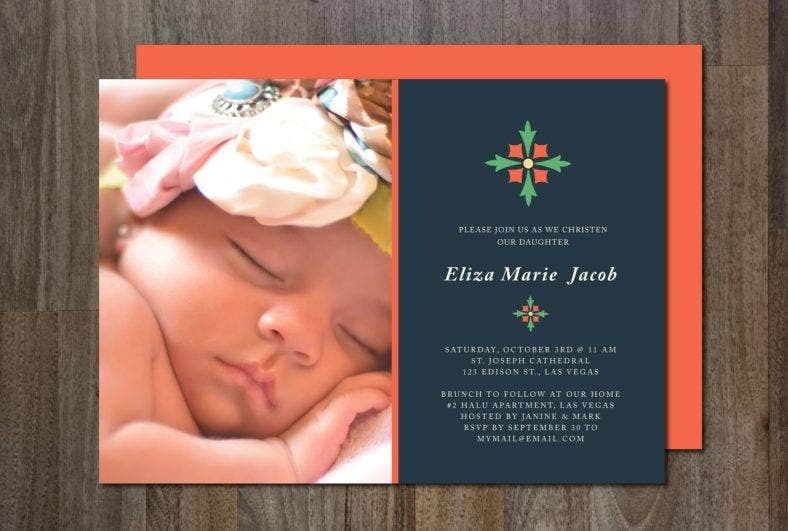 You may also like sample photo invitation templates. As we said, the invitation will serve as the introduction to the event. As such, the recipients will highly anticipate for it once they receive the invitation. Once they receive it, they will most likely make preparations for the event, such as planning on what to wear or what to bring as a gift. They will get excited to not only attend the event but also to see you and your baby, especially those who have not yet seen your little bundle of joy yet. You may also like word invitation templates. After the christening, the invitation can serve as a beautiful reminder that the guests had attended such as memorable and meaningful event. Some people keep them as a memorabilia that they will treasure for the rest of their lives. They can view it from time to time and reminisce the memories that they created during the event. 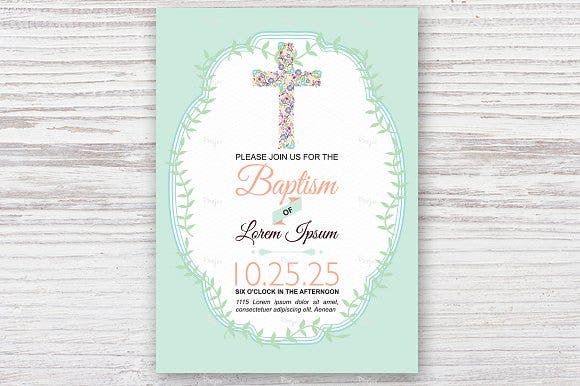 You may also see baptism invitation cards. 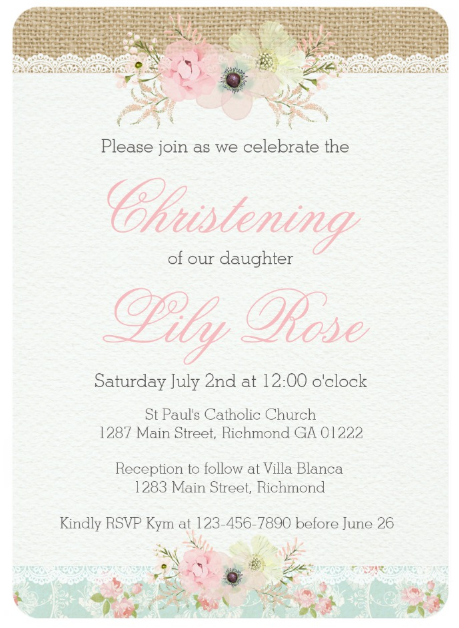 Customization of the christening invitations depends on their format, whether they are handmade or digital. Most of the templates that we have provided are in digital format, but there are those that are handmade and they need to be shipped. But, even if they are handmade, there are still ways to customize the invitations. The customization of handmade invitations will most likely be done by the seller. You can send them details on how you want the invitation to be customized into, like changing the color, shape, and size of the elements. However, in most cases, this kind of request usually requires an additional fee. So just prepare your credit card or wallet for an increase in your budget. Also, you need to have constant communication with the seller and ask for updates on the progress of the customization of the invitation so you will get your ideal results. Before, editing graphics files require an assistance from a graphic designer. But as technology progresses, there are new and easier ways on how to edit and customize these files by yourself. You just need the determination to create your design as it will be a tedious task. But, if you are still learning how to edit the templates, we will provide you with easy steps to follow. Download a photo editing program or access one online. Photo editing can be done via a smartphone or a computer. So downloading one will depend on which platform you are going to use. In the case of using a computer for the editing, you need to download installers online or by an installer from a verified seller. When you download online, make sure that it is a legit installer and not some scam that only contains viruses. When it comes to editing on a smartphone, you can easily download an app through the phone’s app downloader or installers, such as GooglePlay or iStore. However, if you don’t want to go through all the installation processes, you can always search for online photo editing apps. They are accessible and easy to use, which makes it less problematic for you. Download your desired template. Have you found the right design? If so, you just need to purchase and download it. All of the templates that we have shown you are premium ones, so it is expected that they come with a price. But, rest assured that they are priced accordingly. The prices range from cheap to affordable ones. 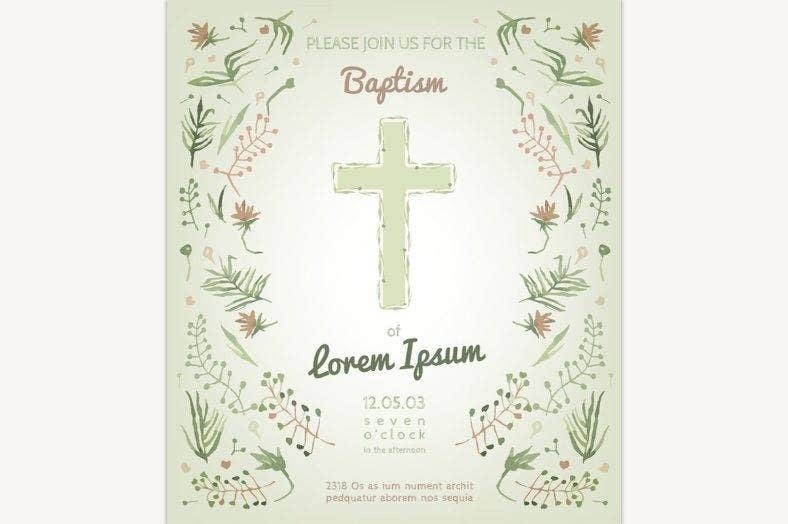 You may also see simple baptism invitation templates. Use the photo editing software to open the template. After downloading a photo editing software or finding an online app, try to open the newly downloaded template. You don’t have to worry about the compatibility of the files as their formats are highly compatible with most of the commonly used photo editing apps, even those online. Edit the template. Once you tested opening the template, it’s time to have fun! Let your inner artist lose when you customize the template. Think outside the box? No. Think that there is no box. There is no limit as to how you can customize the template. Change any element you want. Just make sure that the end result is what you actually want. You may also see invitation card examples. Save it! This is the most important step of all as you need to export a file from what you just edited. Save everything that you have made. It is also important to note that you save your progress periodically. This will help in times when your computer or the photo-editing app unexpectedly crashes down. You need to have a save point so you won’t start from scratch. In saving the design, you also have the option to overwrite the original file or export a separate file that contains all the changes you made. Doing so allows for future edits of the original design and create multiple designs from it. 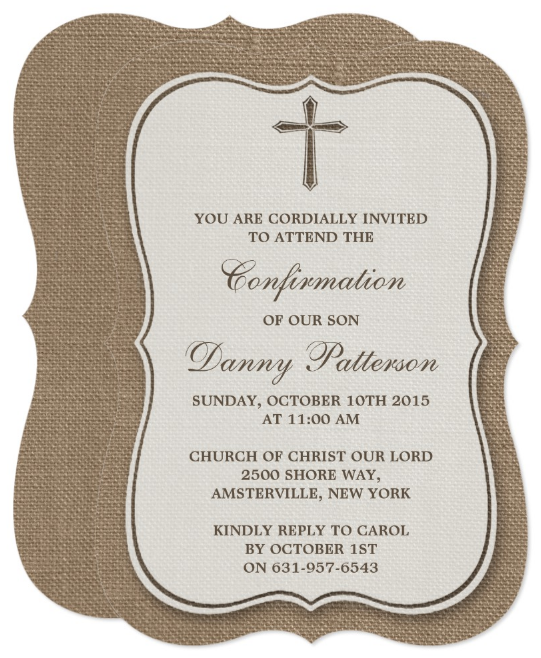 You may also like formal invitation templates. Start giving out the invitations! A christening is an important event that you don’t want to make a mess of. Everything has to be perfect and pleasing as what you imagined it to be. In your invitations, make sure that you have found the perfect design that will complement the overall aesthetic of the event. 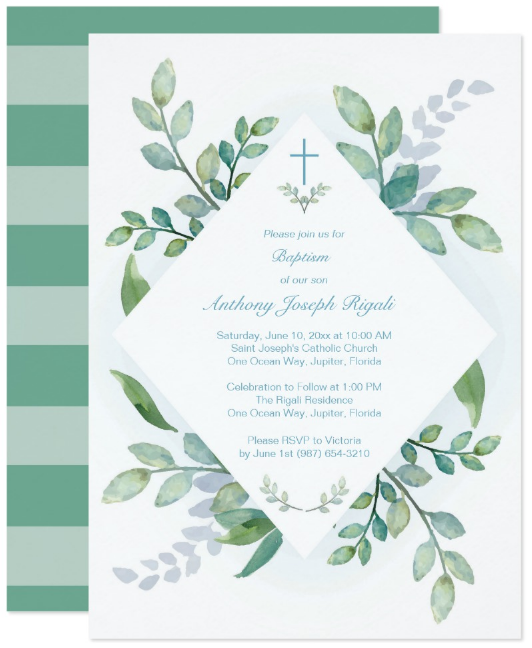 If you have a blue motif, then having a blue christening invitation will most likely be the best option to take. You may also see sample invitation cards. If you found this article to be helpful, bookmark this page and help share it with your friends and family. They might need it for future reference. We wish you the best of luck for the event and we welcome your new angel to the Christian world! You may also like sample Christmas invitation templates.